Braised “Veal” With Rapini Leaf and “Fava Bean” Risotto — Top Chef All-Stars Night | Eat.Drink.Life.Love. As the Top Chef All-Stars competition heats up and the chefs enter the finals, their dishes tend to be more complicated and less friendly to the home cook, with hard-to-find ingredients. So Top Chef night requires adaptation on our part, but I think we’re getting rather good at it (in most cases). When the chefs took a walk down geneology lane and made dishes inspired by their ancestors, Antonia’s Braised Veal with Rapini Leaf and Fava Bean Risotto (influenced by her Italian roots) stood out. 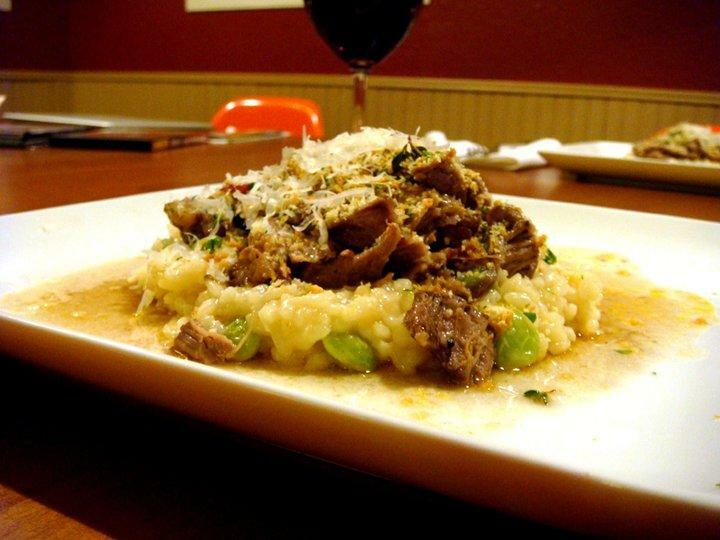 Neither of us is Italian, but we can braise and stir Arborio rice with the best of them! Kowalski’s markets carry untethered, group-raised veal from a farm in Wisconsin (I believe), but they only had veal scallopini which was too lean and thin for this dish. So (after some discussion via text message), we decided on lamb shoulder. Pork shoulder braises really well in our crock pot why shouldn’t lamb shoulder, right? Before leaving the house for the afternoon, I salted, peppered and lightly floured the lamb shoulder then sauteed it to brown it in a pan. In another pan I sauteed some chopped celery, onions, carrots and tomato then dropped in some tomato paste. I added about 1/2 cup of red wine and 1/2 cup cognac (to replace the armagnac) and boiled off the alcohol. I dumped the mixture into the trusty crock pot, put in the lamb and a sprig of thyme and parsley and covered up the meat with chicken stock. The crock pot did the rest of the work on our protein that afternoon! When the risotto was creamy I threw in some Parmesan, the rapini and lima beans, some lemon zest and a pat of butter while K shredded the lamb. He topped everything with the bread crumb mixture and added a spoonful of the flavorful braising liquid and it was time to eat. The lamb was falling apart and had a pleasant and deep gaminess. The risotto still had some bite but was beautifully fluffy. The rapini added nice greenery, not too bitter, but I *hated* the lima beans — grainy and slimy and obnoxiously bland. K didn’t mind them, but I picked them out of my risotto. The gremolata added a nice crunch and citrus pop. Antonia’s homage to her Italian heritage was a great and comforting way to send off winter. But we’re very much looking forward to the bright flavors of spring that are just around the corner. * Used lamb shoulder instead of veal shank, cognac instead of armagnac and lima beans instead of fava beans. * Skipped the veal demi cubes. * Made the meat in the slow cooker/crock pot instead of using a pressure cooker. Oh my gosh, I also love my zester! It doesn’t get enough use in my opinion. Guess I better get on that. So what kind of rice did you use? And how long did you actually stir? I get super impatient and often either speed up the process or give up, neither of which is the best, I’m sure. As for beans, I’ve been experimenting with different kinds and very disappointed when I can’t find the variety a recipe calls for (recently I’ve looked high and low for cannelini – shouldn’t be that hard to find, retailers!). We need to find a good bean-monger for the good of us all!